Carolina Colours - New Bern’s New Year’s Eve Block Party! 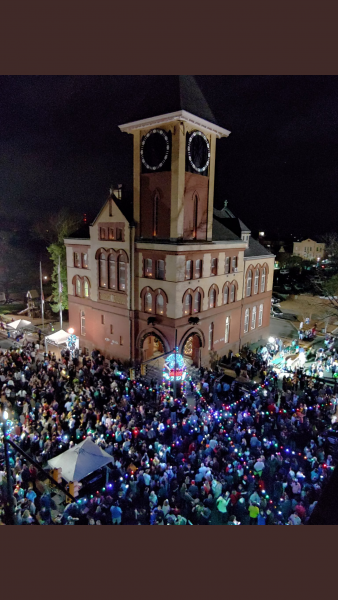 New Bern’s New Year’s Eve Block Party! New Bern hosted its first ever New Year’s Eve Block Party to ring in the new year last night! Taking place at the intersection of Pollock St and Craven St in front of City Hall, there were food trucks, beverages available from Beer Army and the Bravo Alpha Foundation, the Kids Fun Zone (magic shows, face painting, inflatable slides and boucy house! ), and the music stage to bring everyone together in the streets! The stage saw Adam Pitts, known for his one-man-band performances and the band Love Tribe to finish off the night! It went all the way through midnight with a “Bear Drop”, where a festive bear packed with New Year’s lights dropped to ring in 2019!